National Migraine Awareness Month is initiated by the National Headache Foundation. There is also a Blogger’s Challenge initiated by www.FightingHeadacheDisorders.com. Migraine definitely needs to improve its image. It almost needs a name change so that people don't associate it with just a headache. It suffers from the same problem that depression does. Both neurological conditions with no obvious visible symptoms and people often use the words 'I'm so depressed' or 'I have a migraine' when they are experiencing neither. This then has the unfortunate effect of increasing the belief that truly depressed people or migraine sufferers may just be faking it. However, I don't think anyone who has seen someone in the middle of a severe migraine or in the middle of a severe depressive episode could possibly think this. Unfortunately many people don't get to witness this as the very nature of both these illnesses mean that during the worst times, sufferers are shut away and are only seen by their loved ones. Thus, the majority of people only see us on our good days hence further enhancing the prejudice. Maybe we should post photos and videos of us during our migraines - hideous I know! Or have 'live with a migraine sufferer for a week'. Hey that could mean we could fly around the world (or at the very least around nice places round the UK) and holiday in different people's houses!!! Then that would help answer your question in your previous post about where best to live so we could call it research too! Agree with everything you write Fiona! I too have always thought that 'others' only see us on good days...love your idea of 'Live with a Migraine sufferer for a week'. Amen!!!! I know at Migraine.com they like to call it migraine disease...and I'm quite fond of referring to it as a neurological disorder much like epilepsy, and as you know they're discovering similarities between the two...though I'm sure you could explain that to me! I love the video/photos idea - and actually i've been trying to build up the courage to post a video of myself having a hideous 3 day migraine on here. Thought I'd try and make it into a video montage, maybe start with me introducing it, looking human so you can see the difference - but it's actually quite tricky to catch the right one - i.e knowing when one will turn into a 3 day event as to when the triptans will work. But maybe a couple of us could put a video together - then I won't feel like such a loser! Or we could all post some videos on here and youtube! It drives me nuts when I go into work and I get comments like hungover huh? And I'm just like, 'if you had any idea what it feels like inside my head!' especially now, switching onto topamax and my head is agony, trying to avoid MOH so been slathering my face with tiger balm. No one actually understands just how bad it is, how debilitatiting, disabibiling. It's only a headache afterall! Out of interest how long did it take to start working for you? Nortryptiline worked pretty quickly for me but I couldn't cope with the side effects. 3 Weeks in and on 75mg of topamax now and getting daily headaches... :-( also lovely pins and needles in my feet that wake me up in the night haha. Sorry for all the posts but I can't find an answer online anywhere and you might be able to help! With MOH I get that with Triptans it's no more than 10 days a month if I want to avoid them... but does dose have any impact on that at all? Because I have found that 1 50mg sumatriptan pill works for me, 2 actually gives me massive muscle aches and makes me need to sleep. So am I in any way allowing myself extra days? :-)if not it totally isn't fair haha. Hi Maggie! So I'm not sure I totally understand your question - I've actually written a post re MOH which might explain it a bit better and has some links to organisations and sites which could help you? You're not in the UK are you? Days are more important than dose, you're right there - but you shouldn't exceed the 'stated' dose. i.e so I'll often take 2 of my Zomig's on a tuesday if I've got a really bad migraine. And if you want to branch out to 11 and find that doesn't give you MOH that's not unheard of, as we're all different.... but obviously I'm not a doctor! But here is the post I did...again, sorry not sure I've understood your question! Right, got you. I'm guessing not - as it is the days that matter - so you shouldn't take more than 2-3 days a week, or rather you should have a few days clear a week, so I understand. Though obviously my neurologist says that each case is individual and some people can handle more without getting MOH and some get MOH on less than 10 days - but yes, even though you're taking under the max dose it's still, sadly, the days per week/month that matter. But as I'm not as Dr maybe check with the Migraine Trust and ACHE websites? Or call the Doc who prescribed it? And if you're finding this isn't giving you enough pain relief do call you're Doc & ask about NSAID, like naprox sodium that are less likely to cause MOH while the Topamax kicks in. I think you also asked about how long that took to work for me - well I built up so slowly its hard to tell, and I also have nerve blocks and other treatments - but over two months or so I'd say! Does this make any sense at all? Yeah. The doc that prescribed it didnt think it even gave you a MOH so no point asking him lol. I prefer to do my research myself! Oh and yes, I am UK based! I didn't even know about them. I do come down occasionally so it may have to be something I consider. I'm in the midlands. It took me years to find a doctor who trusts me, I'm actually quite well researched right now, my doctor even suggested I study pharmacology which is a nice compliment (this wasnt the one who gave me the triptans, my guy takes a few weeks to get in to see). Thing is I do understand GP's can't know everything that's what specialists are for, but specialists don't seem to want referals (my dr is also very honest with me about the system!) I'm honestly not sure what else anyone could tell me now... I've had a CT scan, I feel certain we're not going to find a cause now, so it's just about finding treatment options. We can put it in this way, a headache can be a migraine but a migraine could not be put as an ordinary headache. Migraine is a very tricky disease which can lead to stress and depression, and sometimes, suicidal because the victim could not anymore endure the pain. Medication is the only solution to it but we need to be sure on what person we approach, as much as possible, it should be a licensed doctor or health expert to be sure our safety. Hi Will - yup - I guess we do need to be careful. Lots of people get duped and conned of lots of money by people claiming they have a 'cure' for migraine - which, as I'm sure you know, doesn't yet exist. 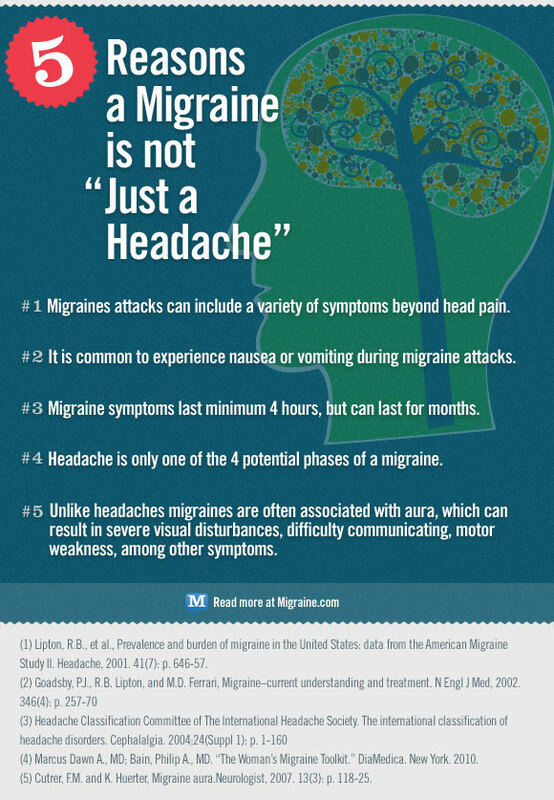 Great information, many a time we ignore this headache but its needed to take care and analyze is this a normal pain or serious one.